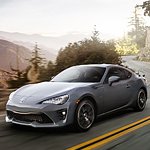 The 2019 Toyota 86 is one of the top sports cars on the market. Due to its driver-focused technology and easy-to-read driver alerts, you can stay comfortable and safe on the road. There are a lot of advantages for those who commute every day and want entertainment as well. You can seamlessly connect to your phone and get access to all of your apps, as well as voice-activated commands. There are a few upgrades available for the 86 including moon roof, surround sound, GPS, and satellite radios. You may want to add on more connectivity through your center console as well. This includes a 7.1-inch touch screen with more driver assistance features, such as blind spot monitoring, lane keep assist, and other assistance guides. The Toyota 86 has been updated into the sports car of the future. Do you want to drive in style? Why not check out the stylish 86 at Mann Toyota located in Prestonsburg.